Photo credit: Robotics & Perception Group, University of Zurich. When a drone flies close to a building, it can temporarily lose its GPS signal and position information, possibly leading to a crash. 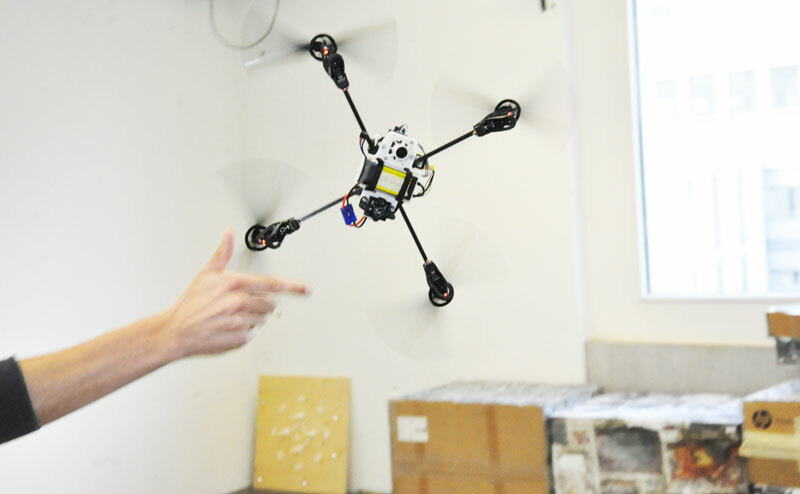 To ensure safety, a fall-back system is needed to help the quadrotor regain stable flight as soon as possible. We developed a new technology that allows a quadrotor to automatically recover and stabilize from any initial condition without relying on external infrastructure like GPS. The technology allows the quadrotor system to be used safely both indoors and out, to recover stable flight after a GPS loss or system failure. And because the recovery is so quick, it even works to recover flight after an aggressive throw, allowing you to launch a quadrotor simply by tossing it in the air like a baseball. Our quadrotor is equipped with a single camera, an inertial measurement unit, and a distance sensor (Teraranger One). 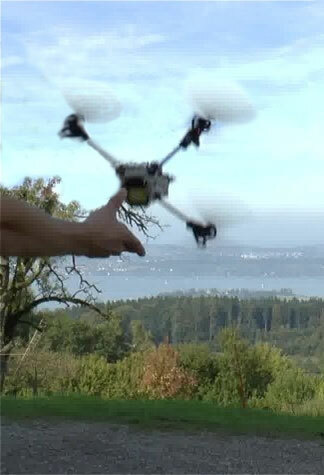 The stabilization system of the quadrotor emulates the visual system and the sense of balance within humans. As soon as a toss or a failure situation is detected, our computer-vision software analyses the images for distinctive landmarks in the environment, and uses these to restore balance. All the image processing and control runs on a smartphone processor on board the drone. The onboard sensing and computation renders the drone safe and able to fly unaided. This allows the drone to fulfil its mission without any communication or interaction with the operator. The recovery procedure consists of multiple stages. First, the quadrotor stabilizes its attitude and altitude, and then it re-initializes its visual state-estimation pipeline before stabilizing fully autonomously. To experimentally demonstrate the performance of our system, in the video we aggressively throw the quadrotor in the air by hand and have it recover and stabilize all by itself. We chose this example as it simulates conditions similar to failure recovery during aggressive flight. Our system was able to recover successfully in several hundred throws in both indoor and outdoor environments. More info: Robotics and Perception Group, University of Zurich. M. Faessler, F. Fontana, C. Forster, D. Scaramuzza. Automatic Re-Initialization and Failure Recovery for Aggressive Flight with a Monocular Vision-Based Quadrotor. IEEE International Conference on Robotics and Automation (ICRA), Seattle, 2015. M. Faessler, F. Fontana, C. Forster, E. Mueggler, M. Pizzoli, D. Scaramuzza. Autonomous, Vision-based Flight and Live Dense 3D Mapping with a Quadrotor Micro Aerial Vehicle. Journal of Field Robotics, 2015.